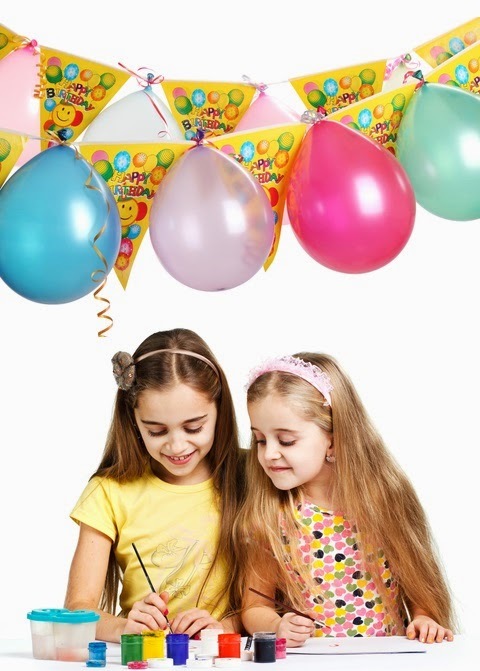 Let your imagination go wild with this fun party theme. If your kid loves to paint, draw or create, they will enjoy an artist party. Instead of traditional party games, plan simple art activities but keep in mind that art is about the process not the final product. Instead of planning craft activities where the guest make something from a model, provide a variety of materials and let the children be creative. Younger kids will enjoy creating masterpieces using finger paints, clay,and stickers. If you are concerned about messes and spills, take the party outside. Get rolls of newsprint from the local newspaper (they often sell roll ends for quite a bargain). Roll out the paper along the floor or tape to a wall to provide a giant mural or banner that everyone can work on together. Give the children sidewalk chalk to decorate the driveway or sidewalk in front of your house. a room or garage. Tape paper to the plastic along the wall. Partially fill small water balloons with acrylic or poster paint. Tie the end of the balloon with a knot and let the kids throw the paint balloons at the paper and watch them squeel with delite when the balloons splat and color fills the paper. Play Pictionary making sure all of the children get a chance to draw the clue. Or play a sculptural version of Pictionary using play dough or modelling clay. Instead of drawing the clues the children have to sculpt them. Blindfold the children and have them sculpt something relying on their sense of touch or have them draw or paint using their toes or the opposite hand to which they are used to. Do a relay where you divide into 2 teams and have the first person in each team draw the head, the second person draw the eyes, the third person draw the ears, the fourth the nose, etc. Talk about texture and have a scavenger hunt in the yard encouraging the kids to find as many different textures as they can and have them put them in a small lunch bag. Later have them draw or paint something using only one color but have them give different objects different textures to differentiate them or create a picture with the materials gathered from the yard and glued on to a heavy duty paper or canvass. When decorating for your art party use all the colors in the rainbow to create a colorful space. Crepe paper streamers, curling ribbon, balloons and even plastic colored tablecoths covering the ceiling and walls help make everything festive and colorful. Serve a spectrum of yummy dips–jams, nut butters, chocolate sauce, caramel sauce–and diced fruit on a disposable plate or plastic palette. Offer plain breadsticks or pretzel rods for dippers.